Similar species: There are 3 other species of Verbesina in Missouri. One is white crownbeard (V. virginica), with white flowers. The other two are golden crownbeard (V. encelioides), which is uncommon and has leaves with well-defined stems, and yellow ironweed (V. alternifolia), which has 8–100 flowerheads per stem. Yellow crownbeard is the shortest of the four. Height: 20 inches to nearly 4 feet (sometimes shorter). Occurs in upland prairies, savannas, glades, and upland forests, and along railroads and roadsides. Look for it in open and rocky areas. 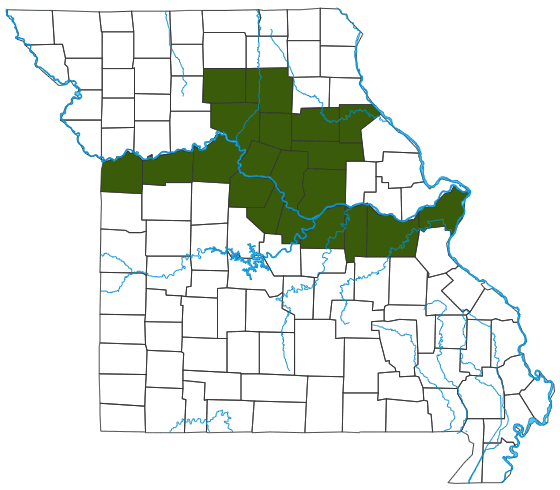 Scattered south of Missouri River and northeast into Linn, Macon, and Ralls counties. Photographers admire Verbesina species because they can form spectacular, photogenic formations called frost flowers in early fall. A sudden overnight hard freeze ruptures the stem, and sap oozes out and freezes into intricate, petal-like shapes, which melt like frost in the morning sun. Mammals and several birds, including quail and songbirds, eat the seeds. Flowers that bloom late in the season provide nectar for butterflies and other insects.